FDA Panel Finds Opana-ER Not Worth The Risk! Opana ER is the brand name of the specific extended release preparation of oxymorphone HCL marketed by Endo Pharmaceuticals, Inc. This was the drug of choice that underlay the explosion of opioid addiction and of HIV/AIDS and hepatitis infections in intravenous users in nearby Scott County, Indiana. Opana is back in the news, but not in a good way for Endo. The FDA assembled an expert review panel last week to opine on whether the benefits of Opana ER outweighed its risk to its users. The short summary of its findings and recommendations is that the benefits do not outweigh the risks, and that the drug’s continued marketing should be controlled in a variety of possible ways including removal from the market, or restrictions on who can prescribe it and under what conditions. Author P HasselbacherPosted on April 2, 2017 April 2, 2017 Categories Opioid Abuse, Pharmaceutical IndustryLeave a comment on FDA Panel Finds Opana-ER Not Worth The Risk! Should Kentucky Physician Assistants Prescribe Controlled Substances? Kentucky’s high rates of opioid prescription must be reduced before even more prescribers are added. National data suggest that adding Physician Assistants to the prescribing mix is unlikely to reduce the number of opioid prescriptions written. Author P HasselbacherPosted on February 11, 2017 February 13, 2017 Categories Opioid Abuse, Prescription Drug AbuseLeave a comment on Should Kentucky Physician Assistants Prescribe Controlled Substances? A Batch of Bad Heroin Arrives in Louisville. Bad heroin is an oxymoron, but over the past week, several dozen opioid overdoses appeared in local emergency rooms or were rescued by emergency medical technicians. At least one died. It is being reported that some 300 overdose cases were reported in our region. Since these patients responded to the opioid-specific rescue drug, naloxone, it is assumed they overdosed on one opioid or another. Toxicology studies are pending, and public health authorities are not overstating what they know, but we can reasonably assume the substances injected or otherwise consumed contained an unexpectedly high amount of heroin; the powerful synthetic opioid fentanyl; or carfentanil, the new-to-the-scene, elephant-strength, fentanyl look-alike. For decades, heroin available to end-users has been cut, or diluted with a variety of non-opioid substances – some more benign than others. In recent years, the availability of higher quality heroin from Mexico has both driven down the price and increased the potency of street heroin. Presumably both sellers and users have been adjusting their practices to account for the greater potency. Uncertainty about the purity or safety of available heroine products is said to be the reason that addicts in southern Indiana chose the prescription drug Opana as their opioid of choice. This of course did not protect them from an accompanying epidemic of HIV infection and viral hepatitis. For reasons not fully known to me, for the past year or more, heroin preparations used by addicted individuals have been shown to contain fentanyl. It is apparent that these augmented preparations can catch whole communities of users by surprise. The arrival of heroin with augmented lethality is signaled by an increase in overdoses and deaths within a confined geographic area. While I was there in the summer of 2015, such an outbreak of heroin-associated deaths occurred in Washington County, Pennsylvania. Author P HasselbacherPosted on September 2, 2016 February 13, 2017 Categories Opioid Abuse, Prescription Drug Abuse3 Comments on A Batch of Bad Heroin Arrives in Louisville. How Did Prince Get His Opioids? Outlying prescribers of opioids and their drug-dependent patients are easy to find, but it is the standard of medical care in America that is fueling our current epidemic of opioid abuse, diversion, crime, and overdose deaths. These tragedies will not be solved by education, treatment, and law enforcement alone; nor by any amount of money we throw at the problem. The standard of care itself needs to be reassessed by the medical professions and the number and nature of first opioid exposures much reduced. He gave us the gift of his music. Might he give us anything else? Is there anything to be learned from his untimely death? As of this writing, there’s no longer any doubt that he died of opioid narcotic poisoning – more specifically of fentanyl overdose. It has also been reported that his addiction to opioids was long-standing, even as it was well hidden from his public. Current popular accounts attribute his opioid addiction to prescription drugs that were begun to treat unspecified injuries related to his vigorous stage performances– as if this somehow automatically legitimizes the use of opioids for musculoskeletal injury or chronic degenerative disease. A claim that “I can’t live without my opioids,” is in my experience generally a symptom of the opioid dependance itself, not the underlying disorder for which the drug was begun. That is why we use the term addiction. Of course there is a place in medical care for narcotic opioids, but we have strayed far from that place today. Fentanyl is the new bad boy. Author P HasselbacherPosted on June 27, 2016 November 6, 2017 Categories Opioid Abuse1 Comment on How Did Prince Get His Opioids? Legislative Tinkering With Needle-Exchange Program: Bad Idea. I learned today that the Republican-controlled Kentucky Senate passed a bill that would prohibit health facilities that currently run needle-exchange programs from giving out more needles than they receive from the substance-addicted people participating in the program. Only “one-for-one” exchanges would be allowed. The primary goal of any needle-exchange program is to prevent the spread of hepatitis, HIV, or other blood-borne infection that occurs when iv-injecting drug users share their equipment. Whether or not a program is successful is measured by changes in new infection rates. Kentucky could use a little help in that department. 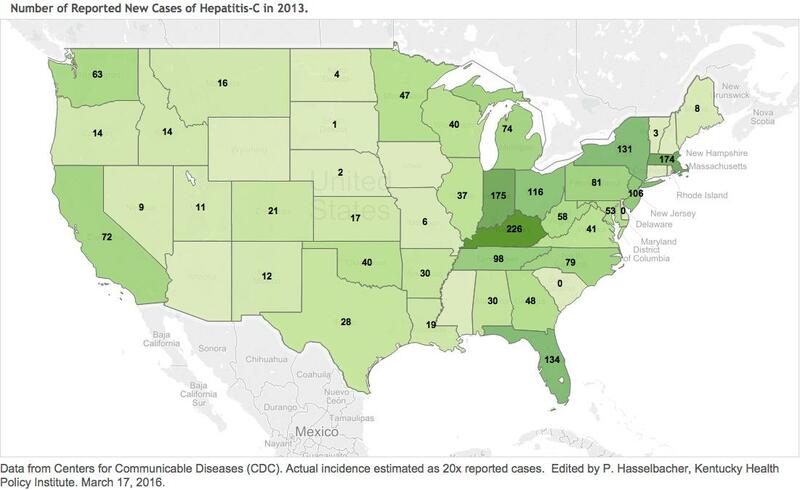 As of 2013, for at least the previous 4 years Kentucky led the nation in new reported cases of Hepatitis-C. That is not a place we want to be, including for reasons I will discuss below. The price we pay in gold and human misery is colossal, whether one abuses drugs or not! The 2013 data set from the CDC is the most recent available to me. I must assume that things only got worse since then. Prohibition and moralizing did not work for alcohol either. It appears that many if not most of the Senate opponents of needle exchange programs in general are driven by puritanical or judgmental motives. There are certainly valid reasons to try to remove used needles and syringes from public spaces to avoid accidental injury, but that can and should be an independent initiative. The successful needle-exchange program in Louisville has made great progress in approaching a one-for-one exchange rate. The last thing we need in Kentucky is to have any of our towns or cities follow Austin, IN into the HIV and hepatitis blasted Hell out of which it will take several generations to climb. Author P HasselbacherPosted on March 18, 2016 February 13, 2017 Categories Opioid Abuse, Prescription Drug Abuse3 Comments on Legislative Tinkering With Needle-Exchange Program: Bad Idea. Per-capita Opioid Prescription to Medicare Part-D Patients in the United States. Test of Tabloid Public software. I am still testing software with the capability to map data geographically. This page may change as I manipulate the page layout. 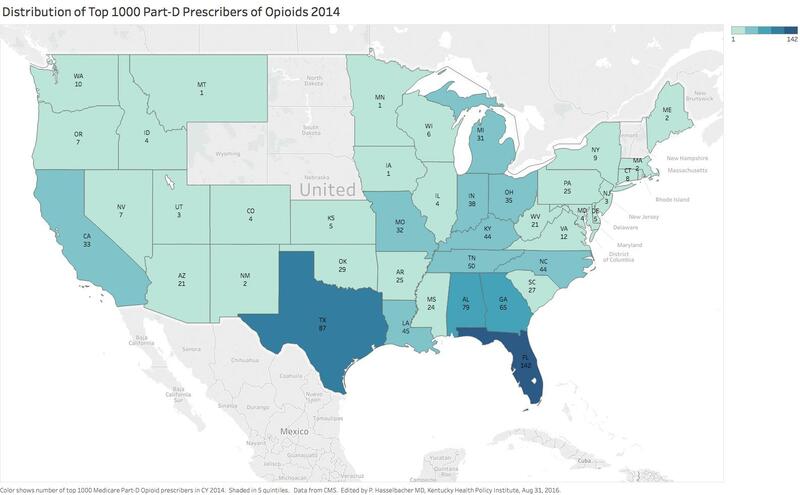 Below is a map of the number of opioid prescriptions written for Medicare Part-D beneficiaries in 2013 divided by the total general population of each state. This version of “per-capita” adjustment corrects somewhat for the large differences in the population amount the states. I have shown earlier that prescriptions of opioids to Medicare patients correlates well with opioid prescription to the general public. It is disappointing to see Kentucky and our neighboring states stand out as hot-spots of prescription opioid drug use. Hover your cursor over the map to interact with the actual data. Here is a link to a full size version. Author P HasselbacherPosted on January 12, 2016 February 13, 2017 Categories Opioid Abuse, Prescription Drug Abuse1 Comment on Per-capita Opioid Prescription to Medicare Part-D Patients in the United States. In a technical test-posting last week, I reworked the dataset used by Medicare to show where prescriptions of opioids to Part-D Medicare patients were written in Kentucky in 2013 by five-digit Zip Code. I reworked the data to add the average number of opioid prescriptions written by an opioid prescriber in that zip code. This supplements Medicare’s own calculation of the percent of all prescriptions that are for opioids in a given area. Both these indices provide insight into the intensity of opioid prescribing in a given area. In today’s posting, I add a map of the same data broken down by Kentucky county. Not surprisingly, significant geographic variation exists in both maps that is compatible both with public perception of places where prescription drug abuse is prevalent, and locations where individual prescriber outliers practice. This particular dataset is based on the principal business address of the prescriber, but I have shown that prescribing of opioids to Medicare patients correlates strongly with prescribing to all patients, and that not unexpectedly, the location of the prescriber predicts were the patients live. Descriptions of the underlying data and caveats for its use are discussed in earlier articles. 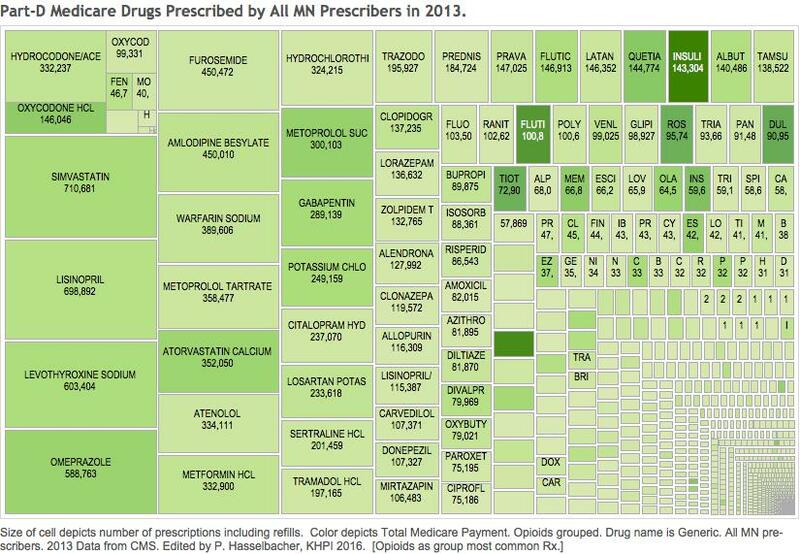 Below is a map of opioid prescribing to Medicare patients by county. The maps are fully interactive. The viewer can use the legend to switch from one measured index to another, or to zoom in on various areas. Clicking on a shaded area displays the underlying data for that county. View a larger version of CMS Opioids KY Counties 2013 created with eSpatial mapping software. Medicare Releases On-Line Application To Map Opioid Prescriptions. Both “hot- and cold-spots” of opioid prescription are easily found. The business address and volume of opioid prescriptions written by Medicare prescribers correlates very well with the volume of opioids consumed by non-Medicare patients and predicts where where they live. The Medicare Part-D Prescription Drug Database can be a useful instrument for medical professional, public health, and law enforcement organizations in dealing with America’s exploding prescription drug and opioid drug epidemic. In its efforts to make our healthcare system more transparent, affordable, and accountable, the Cabinet for Medicare and Medicaid Services (CMS) has just released an on-line website tool map Medicare Opioids that allows anyone to create maps showing the distribution of prescribing for opioids at the state, county or 5-digit ZIP Code level. The underlying data comes from the same initial release of 2013 Part-D Medicare prescription data and is therefore geographically organized by the business address of each individual prescriber but is limited to the subset of patients covered by Part-D Medicare. Author P HasselbacherPosted on November 10, 2015 February 13, 2017 Categories Opioid Abuse, Prescription Drug Abuse4 Comments on Medicare Releases On-Line Application To Map Opioid Prescriptions.